Welcome to the Livinghouse collection of basin taps and mixer taps. 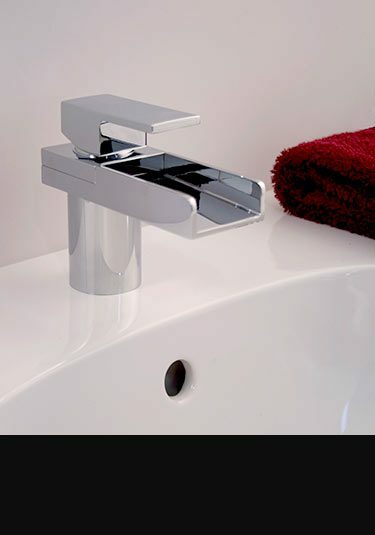 We offer a huge range of traditional and contemporary tap styles required to equip a high quality bathroom. 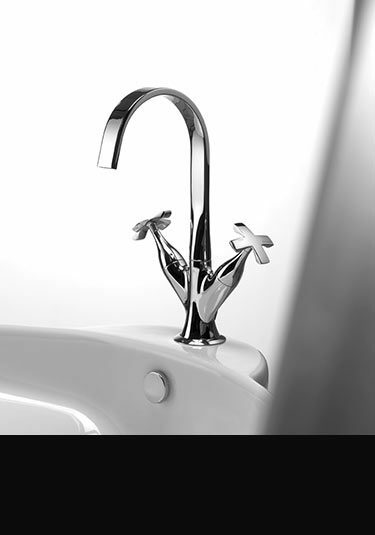 Our taps are from Italian and German manufactures and superb European quality, offering reliability and longevity of service. We supply deck, counter top and wall mounted taps styles and for fancy designer bathrooms freestanding basin taps for floor mounting. Nowadays there are many types of basin tap available apart from just different styles. 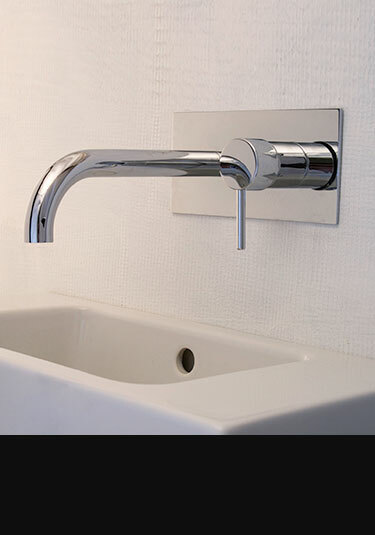 We have pillar taps with are the traditional separate hot and cold tap that fits the classic 2 hole basin. 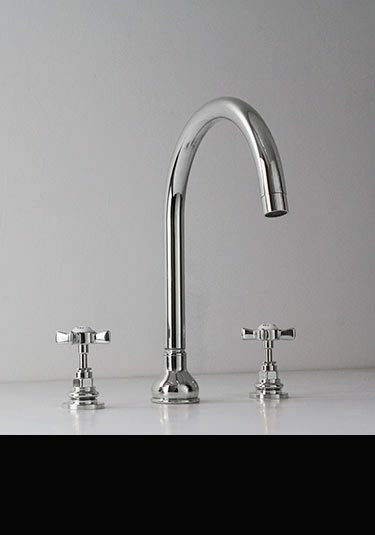 There is also monobloc designs, which use a single mixing cartridge and are better known as single lever taps or just "mixer taps" they use just 1 handle to mix the hot and cold water. 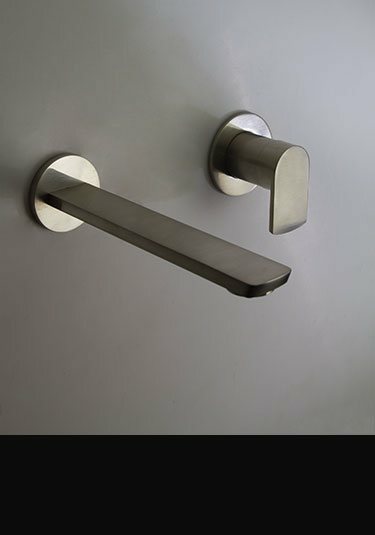 These are generally basin mounted on a 1 hole basin but can also be wall mounted. We also have 3 hole basin taps, these are made up of 3 brassware pieces, a hot tap, a cold tap and a water spout. They can be deck mounted onto a basin, fixed to a counter top or wall mounted by building into the wall above the sink. 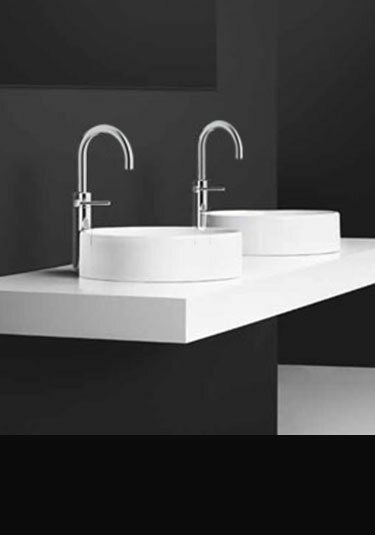 For stylish designer bathrooms we also offer highly contemporary freestanding basin taps and floor mounted filler spouts which are operated via a separate mixer control. 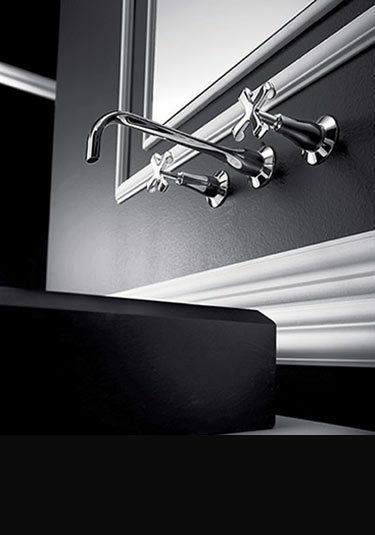 These make a luxury design feature and are usually used within upmarket bathroom styling. 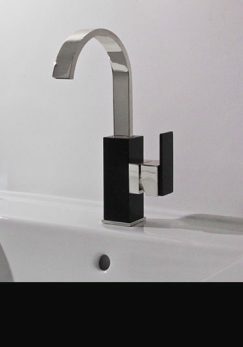 So as you can see there is a big choice of designs, and just to confuse there is also many different tap finishes available. We have the plated finishes of chrome, black chrome, gold, nickel and copper plus the polished and brushed finishes for brass and stainless steel. We also have glass fronted sensor taps which are illuminated and have automatic infrared activation sensors to operate. 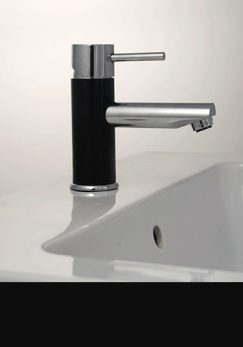 And if you want a coloured tap, we can do white and black powder coated finish as well. 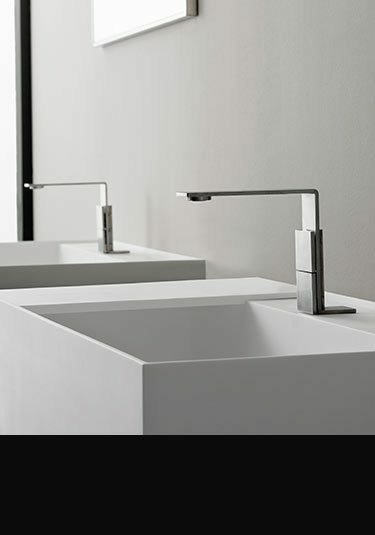 So the conclusion is, there is a lot to think about when selecting a tap style for your basin. But with clear thinking, an individual and exclusive bathroom design can easily be accomplished. 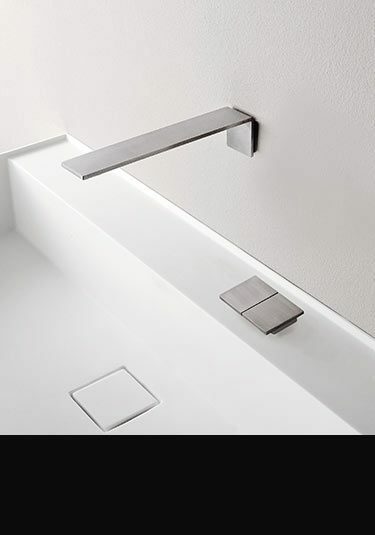 And remember our basin brassware designs are all part of matching ranges which include fittings & accessories for baths, matching shower heads and shower valves so you can carry the whole design theme throughout the bathroom and shower area. This Italian deck mounted basin tap is finished in a brushed stainless steel. 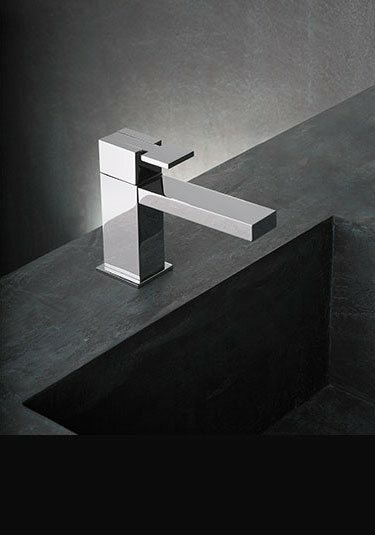 In a minimalist bathroom style, this tap has won International design awards for it unique and exclusive styling. International stainless steel basin tap designed to be wall mounted and finished in a contemporary brushed finish. 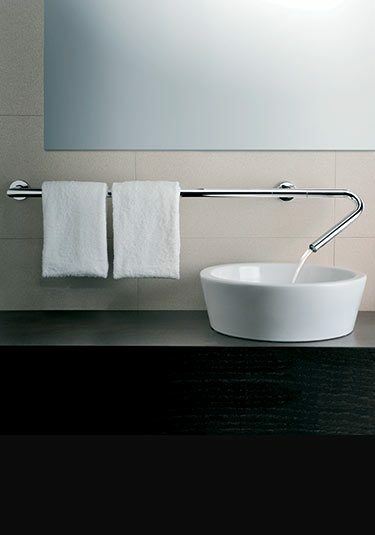 International design winning tap in 2014, this designer stainless steel basin tap makes a superb style theme for minimalist and exclusive bathrooms. Luxury tap design at its best, this Italian stainless steel basin tap is finished in a brushed satin finish. 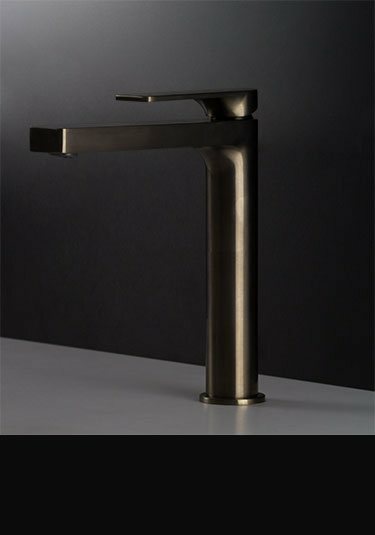 In an ultra thin contemporary style, this wall mounted water spout is controlled via its deck mounted single lever basin mixer. 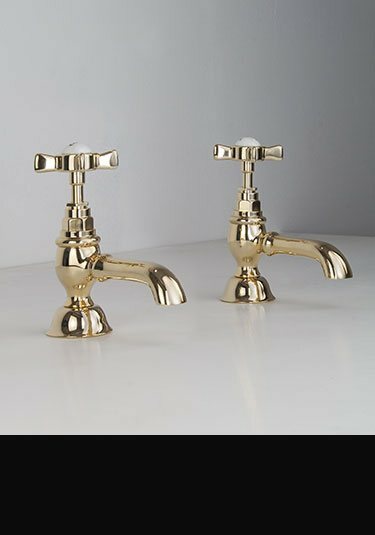 Italian styled gold basin taps in a traditional Victorian style. 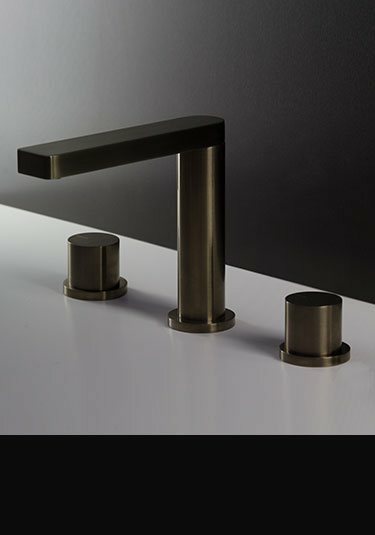 These luxury bathroom taps are great quality and made in Europe. 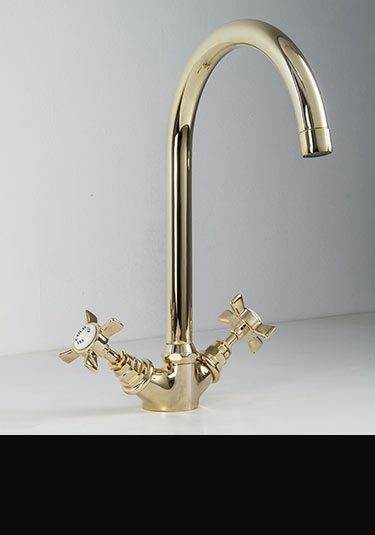 Superb quality deck mounted gold basin taps styled in Italy to an old Victorian design. These traditional basin taps are part of a full Victorian tap collection. 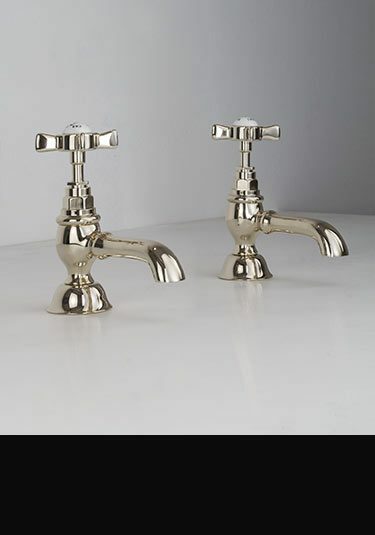 Beautiful 3 piece gold basin taps in a traditional and classical design. This 3 piece basin tap set is luxury quality and Italian manufactured ensuring styling and longevity. 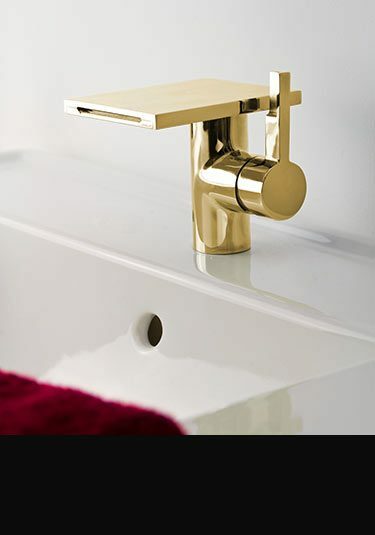 Superb quality wall mounted taps for traditional basins and sinkswith a gold plated finish. This 3 piece basin tap set is Victorian styled and luxury Italian quality for longevity and styling. 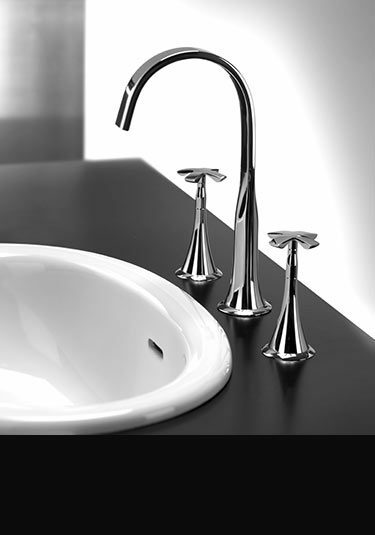 Modern nickel basin taps with a brushed finish that is styled in the latest contemporary Italian styling. Made in a solid brass construction ensures this single lever mixer tap is great quality & lovely design. Beautiful contemporary styling this 2 piece basin mixer is styled for wall mounting and finished in a brushed nickel on a solid brass body. European quality and Italian styling. 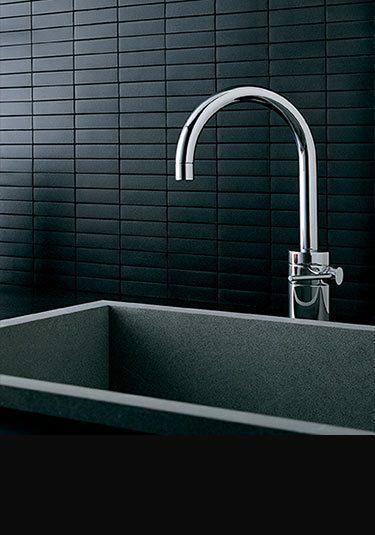 This stylish black chrome single lever mixer tap has a round body with a square cubic spout and is the latest in contemporary bathroom finishing. 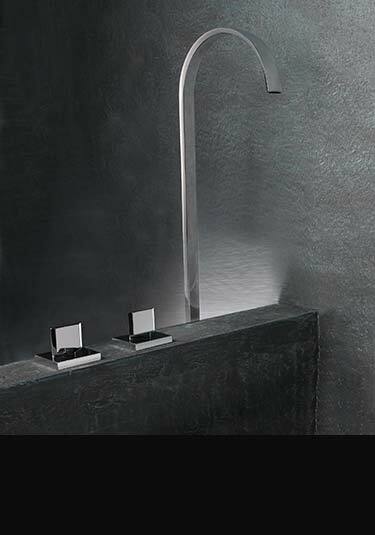 Supplied in polished or brushed black chrome, this designer basin tap has a full range of complimentary bathroom fittings to follow through the design theme. 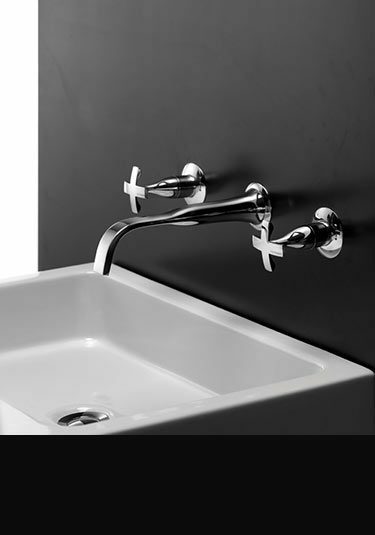 Latest in Italian styling, this black chrome 3 piece basin tap is designed for deck mounting and is available in both polished and brushed black chrome finishes. 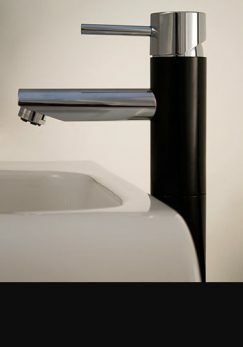 Unique black chrome tall mixer tap with single lever water mixing supplied in polished or brushed black chrome which is a new and exclusive finish within the bathroom industry. 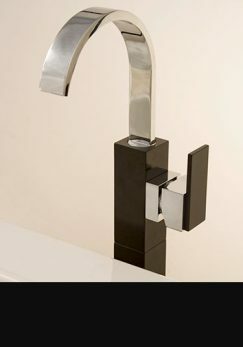 Italian manufactured in the latest design and finish, this contemporary tap is a lovely mix of cubic and round styling. 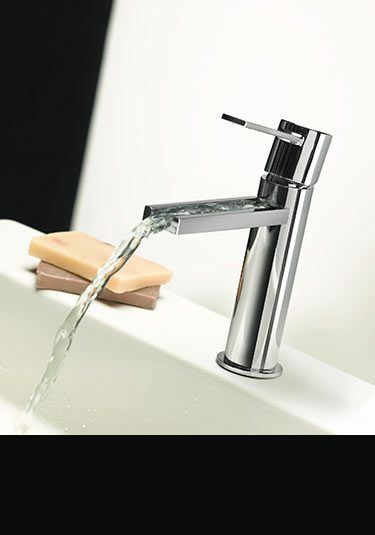 A beautiful collection taps making a stylish design themed for top quality bathrooms. 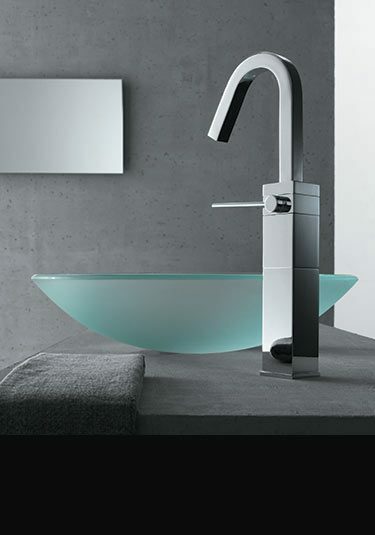 Latest in Italian styling, this stainless steel basin tap is unique because of its coloured handle design. 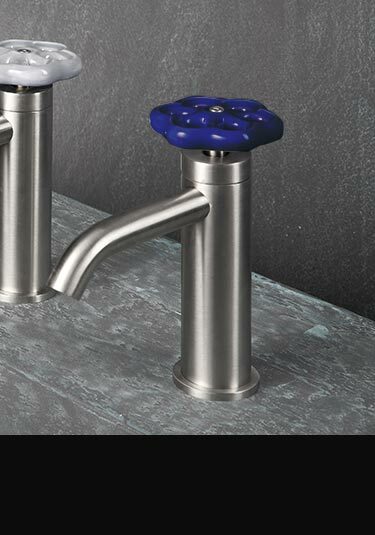 Each basin mixer tap has a brushed finished stainless steel tap body with a coloured handle choice of 8 colour finishes. 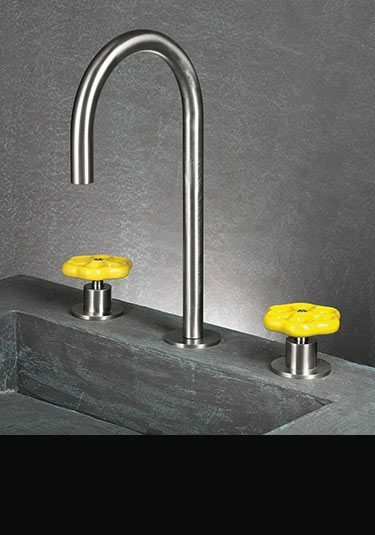 Extended basin tap in a brushed stainless steel finish with a unique wheel mixing handle available in 8 colour finishes. This stainless steel bathroom tap uses the latest progressive mixing cartridge which mixes the water efficiently and is also water saving. 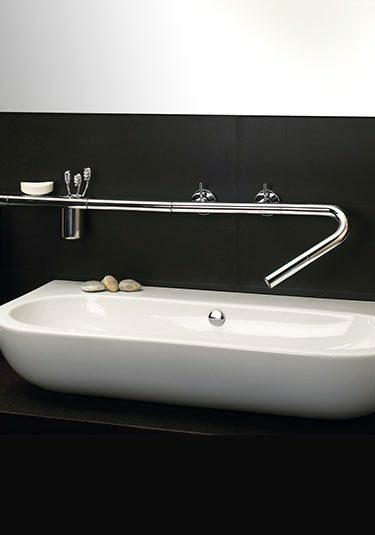 Stainless steel taps are an exclusive design theme within style led bathrooms. 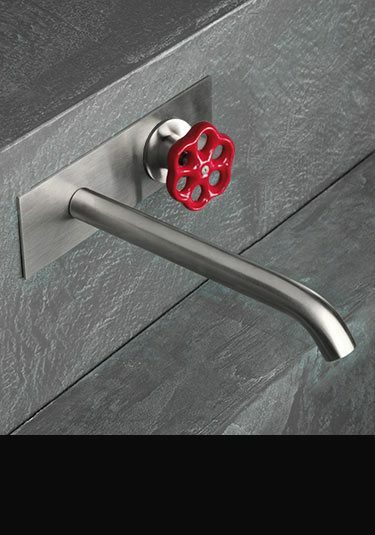 The flower designer wall mounted tap is finished in brushed stainless steel with the unique design feature of coloured handles of which there are 8 colour choices. 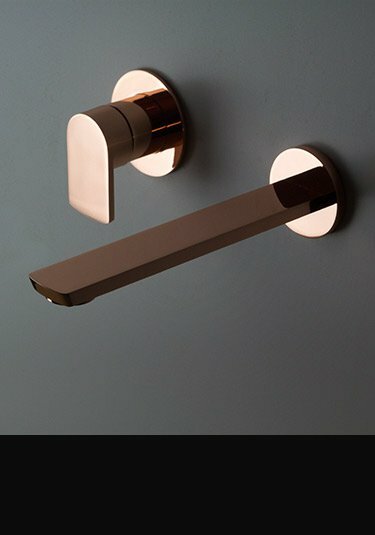 A beautiful mix of colour and brushed stainless steel, these unique wall mounted taps are the latest in European styling. The tap handles are supplied with 8 colour choices. Latest Italian stainless steel basin tap with coloured retro wheel handles. 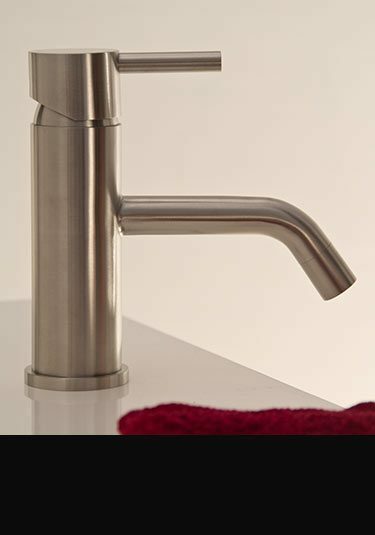 Each stainless steel tap has a brushed satin body finish and 8 colour handle choices. 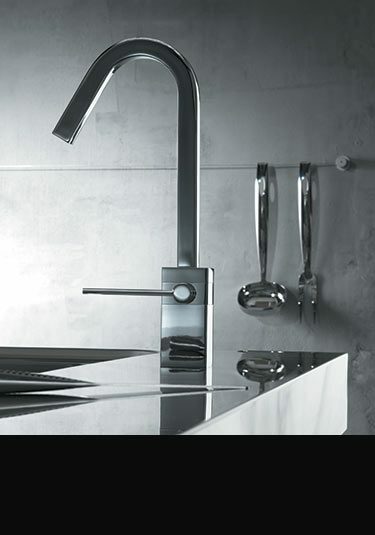 Stainless steel wall taps with a deck mounted spout in the latest Italian styling. These exclusive designer taps are supplied with a choice of 8 colour handle finishes with the stainless steel in a brushed finish. 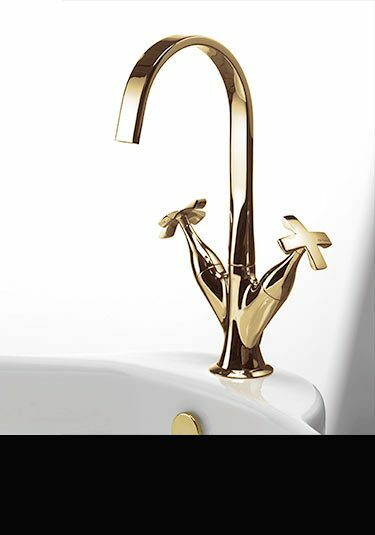 A beautifully styled Italian bathroom tap in a unique and exclusive design. 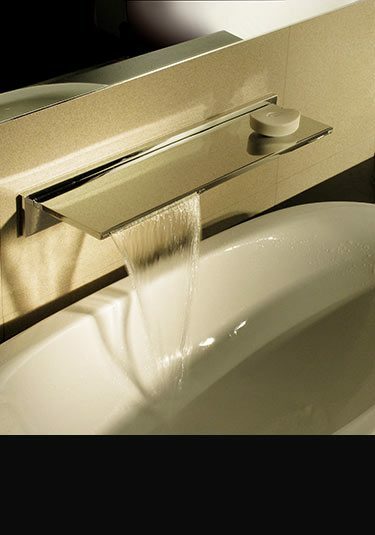 This deck mounted basin tap and spout makes a lovely design theme within a luxury contemporary styled bathroom. 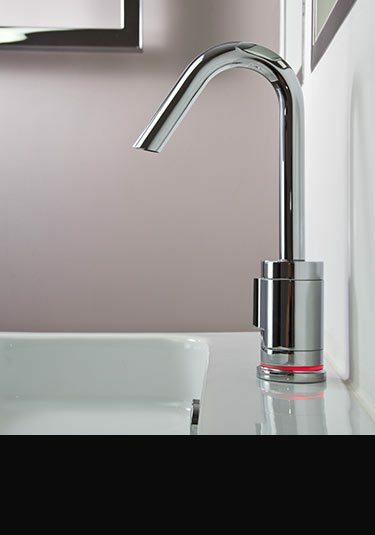 Finished in brushed stainless steel each tap has a ceramic handles which are available in 8 colour finishes. 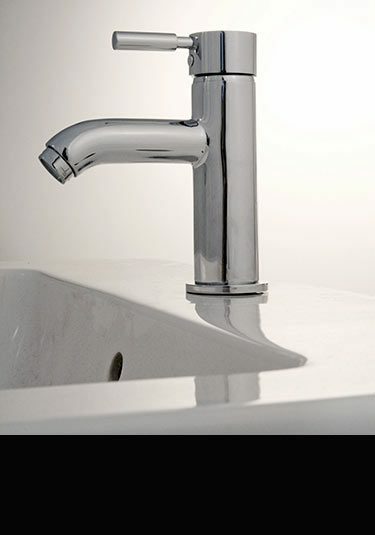 An exclusive surface mounted basin tap that can be supplied in 7 tap lengths. 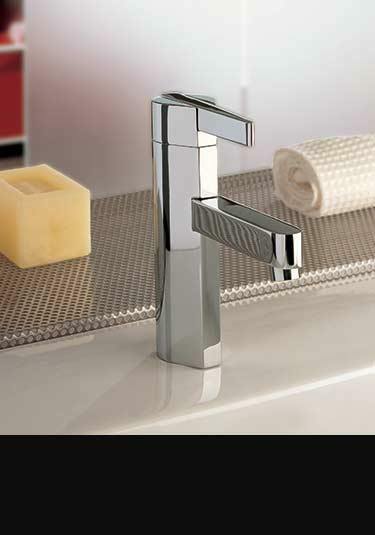 Each designer tap is supplied with a closed spout end with a waterfall version available as an option. 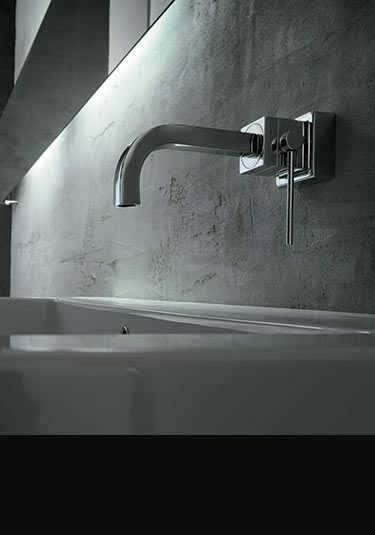 This luxury tap is remotely operated via a single lever mixer tap all adding to the minimalist design. A simple but highly contemporary wash basin spout is a designer touch that high end bathrooms require. 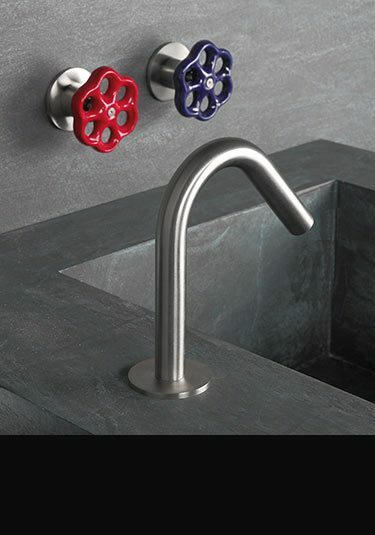 Each spout can be operated remotely using a single mixer control or double mixer tap. 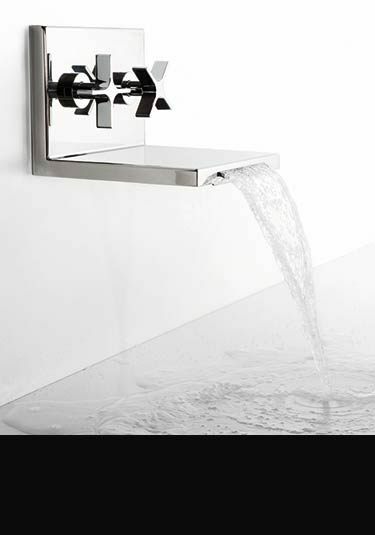 Italian styled waterfall basin tap for contemporary wall mounting. Available in chrome and brushed nickel which gives a stainless steel look. 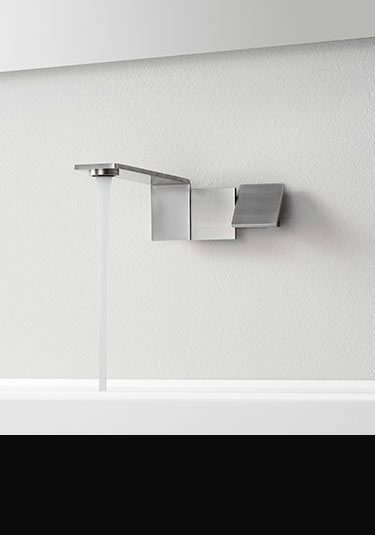 This high quality waterfall tap is European manufactured and ideal for luxury bathroom design. A square styled wash basin tap designed and manufactured in Italy. 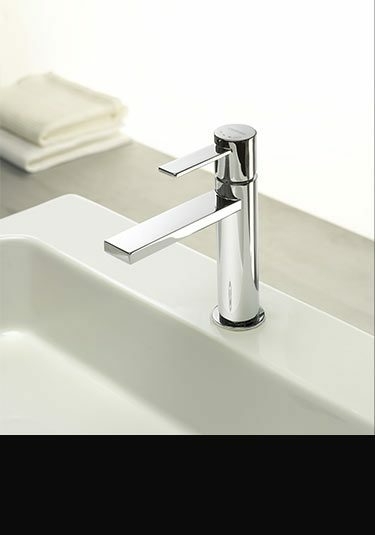 With its Italian contemporary styling and simple single lever mixer control this designer tap is a high quality addition to design led bathrooms. 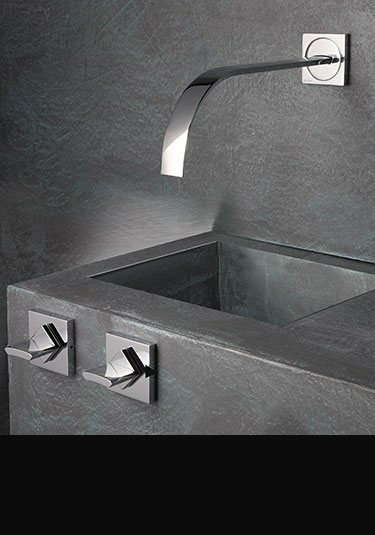 Italian deigned, this cubic wash basin tap is a designer addition to high quality bathroom design. 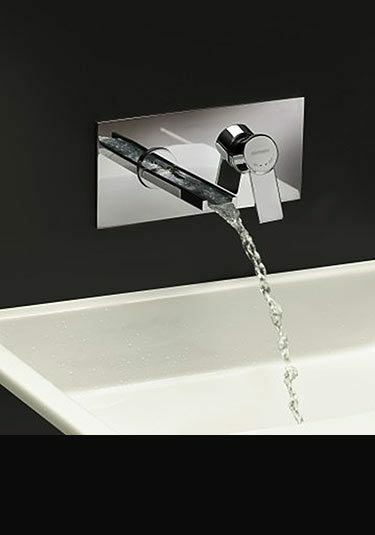 Each wall tap is in a modern square design with the water flow and temperature controlled via a single lever mixer. A tall deck mounted wash basin tap designed for counter top wash bowls and basins. Each extended mixer has straight and square lines and is operated via a single lever tap for easy water mixing and temperature control. 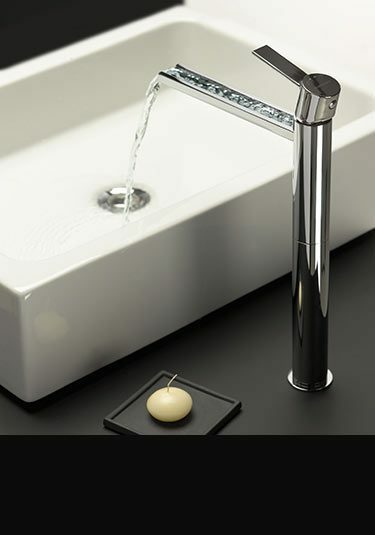 This contemporary styled basin mixer tap has a single lever water mixing cartridge. 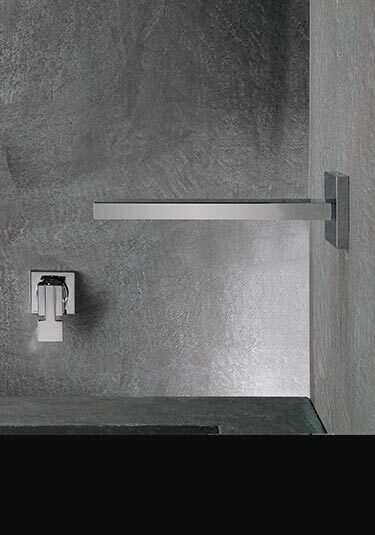 Made in Europe in brushed stainless steel this monobloc tap is a lovely design choice for exclusive bathrooms where something different is required. 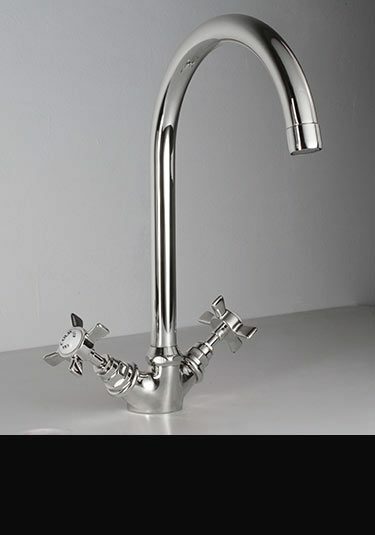 A tall single lever monobloc mixer tap designed for deck mounting over wash basins and wash bowls. Made in Europe in high quality stainless steel which has a satin brushed finish. 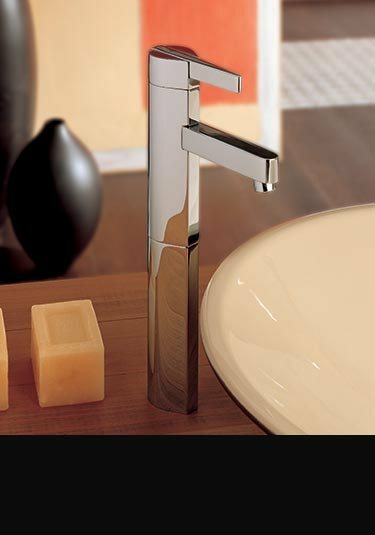 This basin tap is a designer choice for high quality bathrooms. A European quality wall mounted basin mixer tap with a single lever control that is made of stainless steel with a brushed satin finish. Traditional pillar basin taps with nickel plated finish that are styled on an original Victorian design. 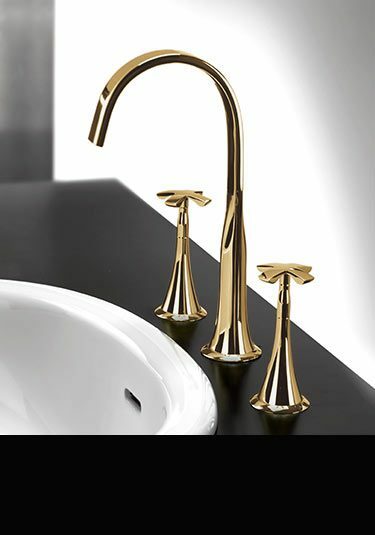 Made in a solid brass construction in Italy, ensures these traditional basin taps are great quality & lovely styling. 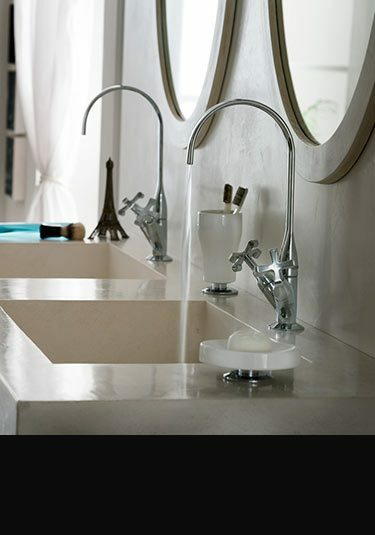 Superb quality nickel basin mixer taps that are Italian manufactured ensuring great quality. Made of solid brass with thick plated finish. A traditional 3 piece basin tap set in a Victorian style. 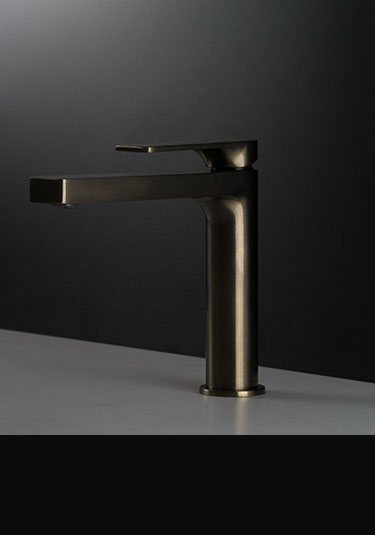 These deck mounted basin taps are made in Italy in solid brass with a smooth polished plating finish, ensuring lovely quality and longlife. 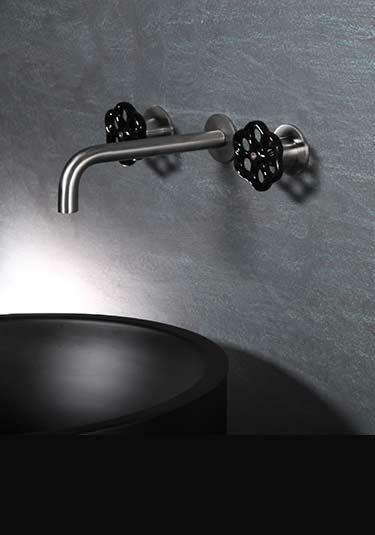 Smart Italian wall mounted taps in a traditional Victorian design. 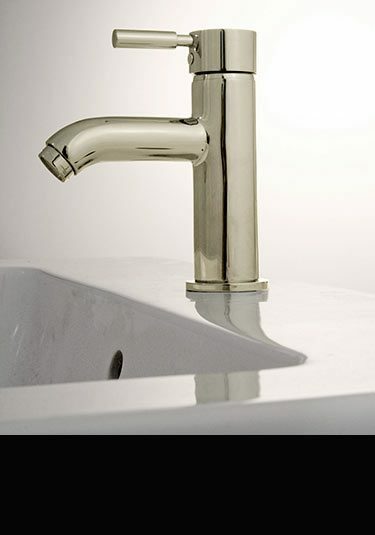 These wall basins taps are plated onto a solid brass body ensuring a superior finish and a long lifespan. 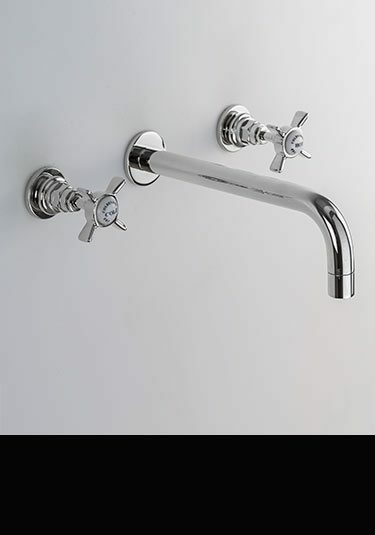 Available as a wash basin tap or as a bath filler, this wall mounted tap is a luxury addition to designer bathrooms. Supplied with a stylish flat water spout and the hot and cold taps on a solid chrome backplate, allowing fast water filling. 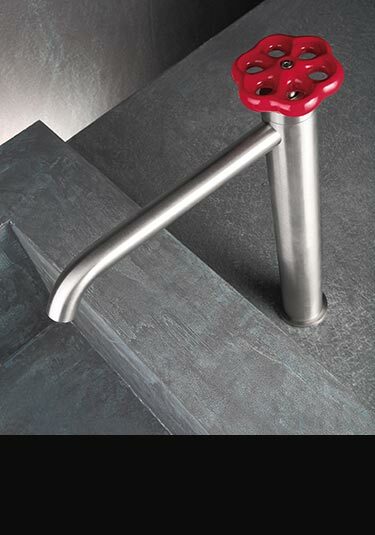 A contemporary styled single lever with an efficient monobloc mixing cartridge. 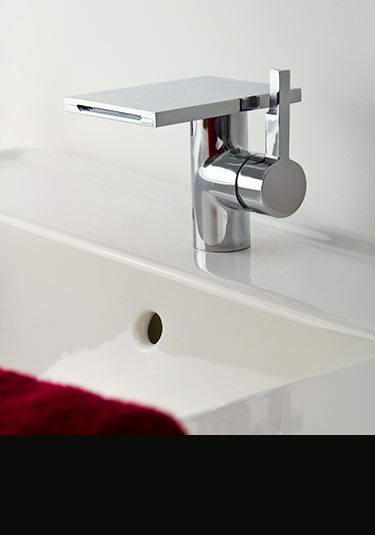 This European made basin tap is a lovely choice in good quality bathroom design. Deserved 15 year guarantee. 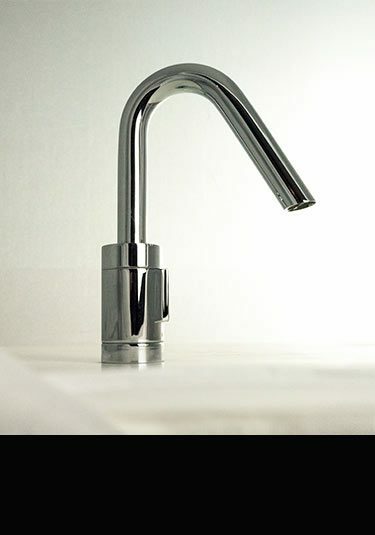 A tall monobloc mixer tap designed for counter top wash basins and wash bowls. Made of solid brass with a thick chrome finish this tap deserves its 15 year guarantee. European made. 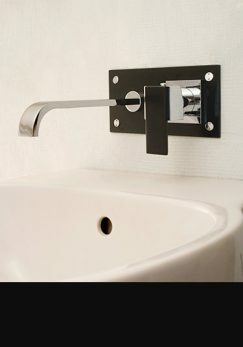 A wall mounted basin tap with a single lever mixer valve and contemporary water spout. 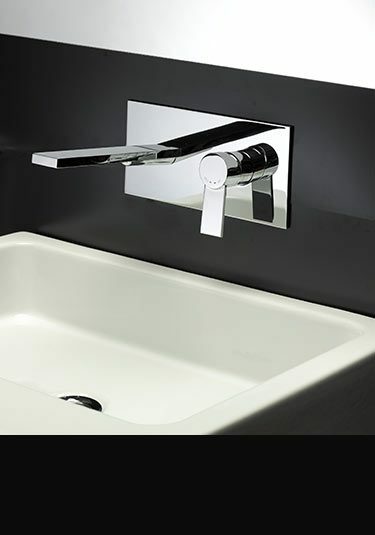 Designed and manufactured in Europe this chrome on solid brass wall tap is a stylish choice for design led bathrooms. 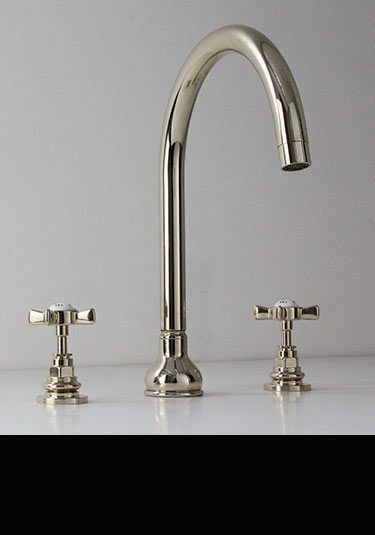 A one hole basin mixer with separate hot and cold taps is finished in a lovely gold plated finish. 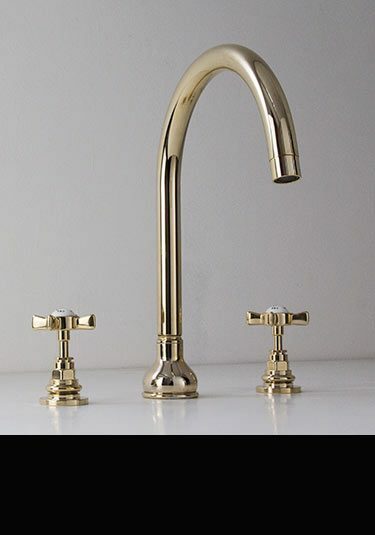 This gold tap has stylish contemporary crossheads that can be used in both high quality contemporary and traditional styled bathrooms. European designed and manufactured. Deck mounted taps with a water spout and separate hot and cold. 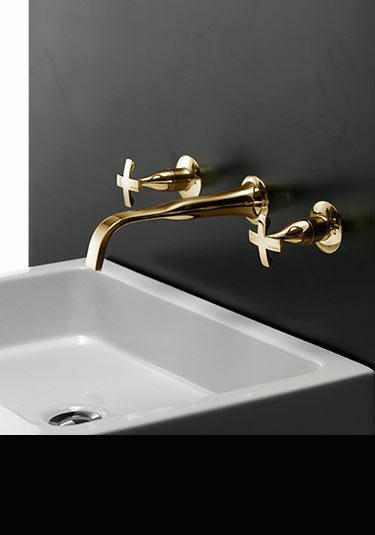 These gold mixer taps are very high quality and manufactured in Europe specifically for luxury bathroom design. Also available in a mellow nickel plated finish. 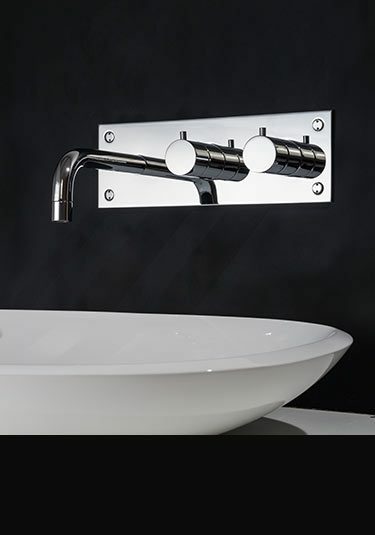 Beautiful contemporary styling on a traditional crosshead design, these wall mounted taps can be easily used in both traditional and designer bathrooms. 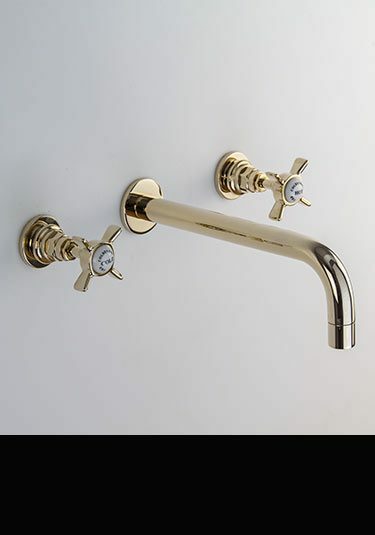 Manufactured in Europe with a thick gold plated finish, these wall mixer taps can also be supplied in a polished nickel finish. A tall monobloc mixer tap with the unique feature of having a built in thermostat. Being thermostatically controlled this basin tap will keep the water temperature constant, whatever the water pressure. Designed and made in Europe. 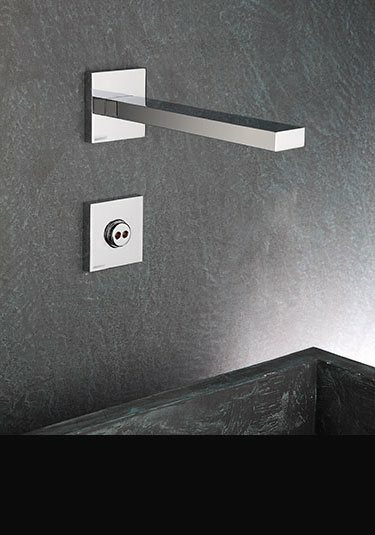 A recessed into the wall thermostatic basin mixer tap that is impressively controlled via a water temperature thermostat. 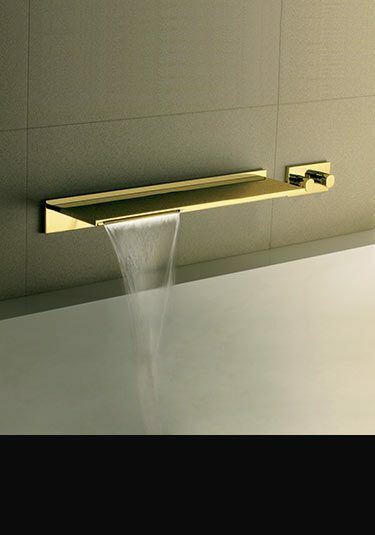 This thermostatic bath filler is a lovely design feature to any designer bathroom. Designed and manufactured in Europe ensuring top quality. 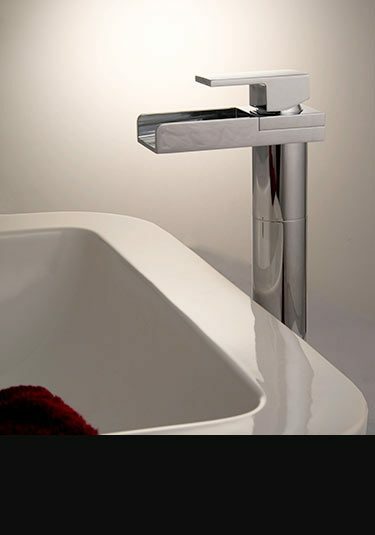 This basin mixer tap is exclusive for its illuminated temperature light. As the water temperture changes the built in light ring changes colour to the heat of the water. Blue for cold up to red for hot. Italian designed and manufactured. 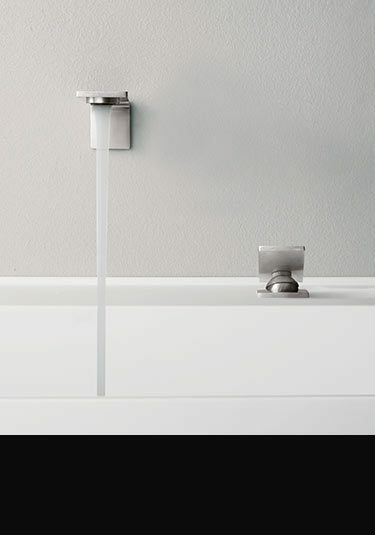 This designer basin tap has an adjustable progressive cartridge that controls the water mixing and temperature. The water temperture is mixed and regulated simply by turning the tap handle. Latest Italian technology. Lovely contemporary styling this single lever mixer tap is minimalist in design and an exclusive addition to high spec bathrooms. Designed and made in Italy ensuring high quality. 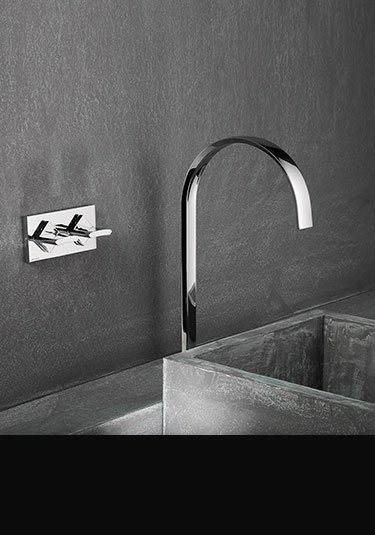 Beautiful contemporary styling and high quality Italian manufacture, this wall mounted basin tap has simple single lever water mixing. 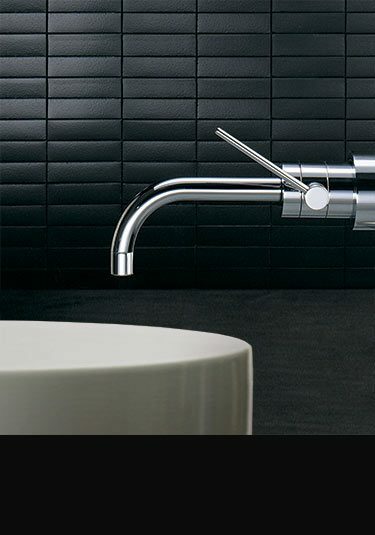 Each mixer tap is a stylish choice for clean cut bathroom design. 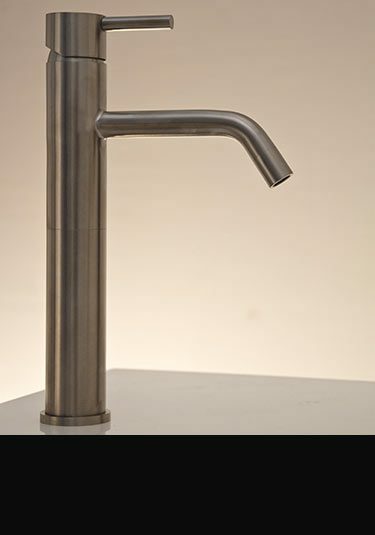 An tall wash basin tap designed specifically for counter top basins and wash bowls. 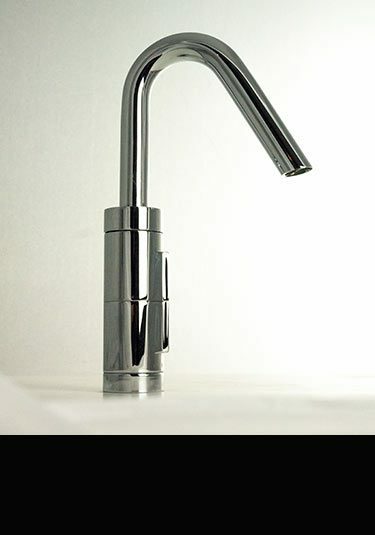 This extended tap has a single lever water mixing and is Italian high quality manufactured. 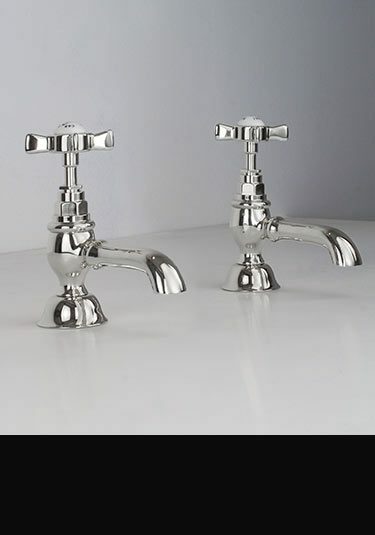 Traditional chrome basin taps for Victorian styled bathrooms. Lovely brass construction and made in Italy ensuring great quality and styling. 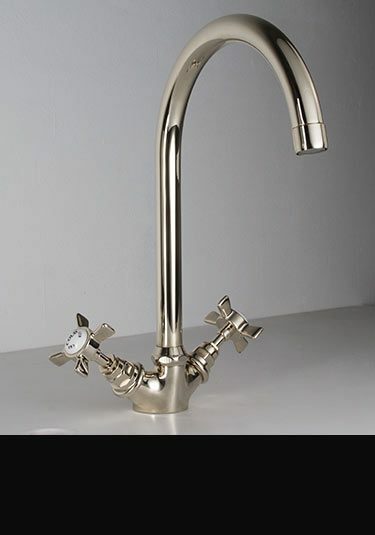 Superb quality traditional basin mixer tap that is luxury Italian manufactured. Made of superior brass with thick chrome plating. Beautiful quality. A traditional 3 piece basin tap set in a Victorian style. 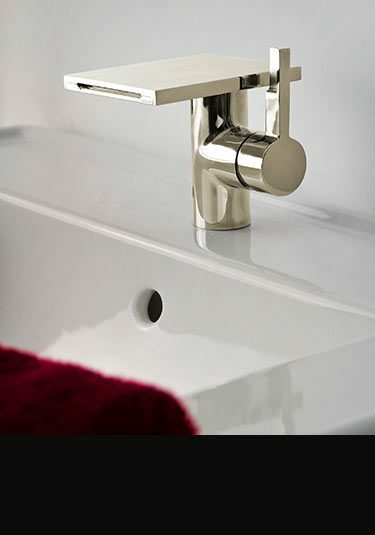 These deck mounted basin taps are luxury Italian manufactured in brass with a chrome plating ensuring a great finish and long life. Lovely Italian wall mounted taps are a traditional Victorian design. 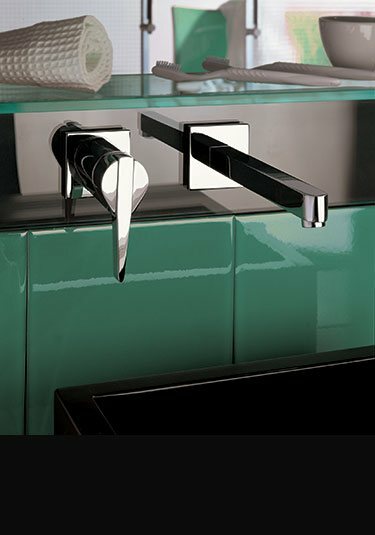 These basins taps are chrome plated onto solid brass ensuring a superior finish and a long lifespan. 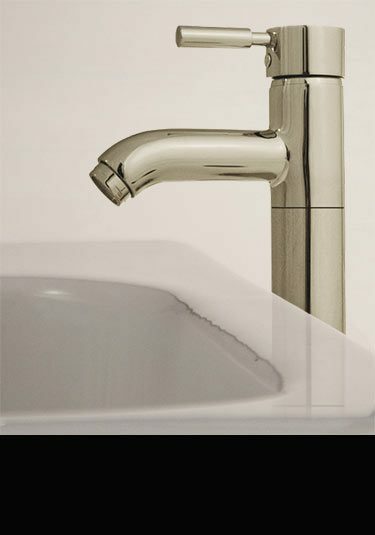 A well engineered basin filler with a unique finger handle that operates the water without lifting the whole head. 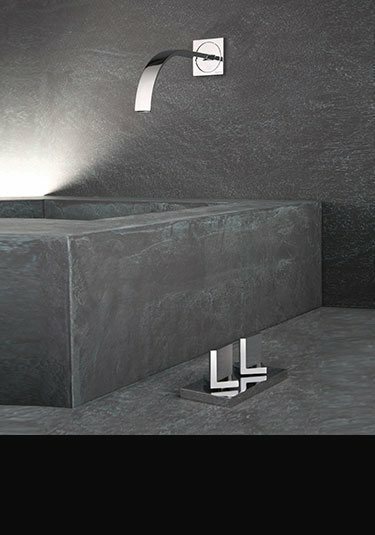 Designed for luxury bathrooms and manufactured in Italy this wash basin tap is an exclusive design choice. This difficult to make tall tap is unique in design. Designed for counter top basins and wash bowls this lovely styled extended basin filler has an impressive finger lifting handle for easy water operation. 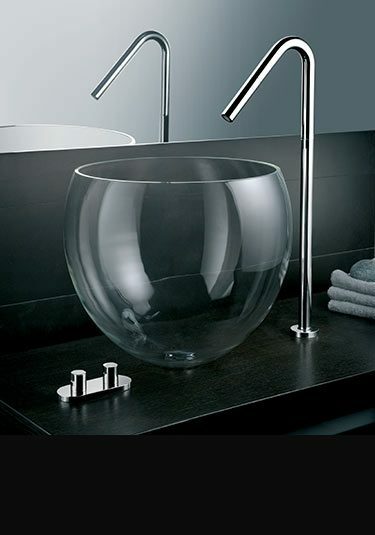 Italian made for top end designer bathrooms. 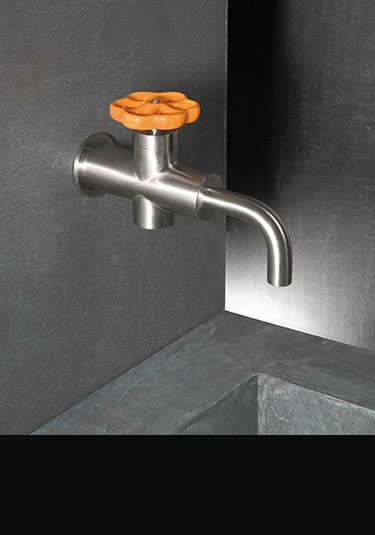 A designer wall basin tap consisting of a 200mm water spout and an easy water mixing valve. 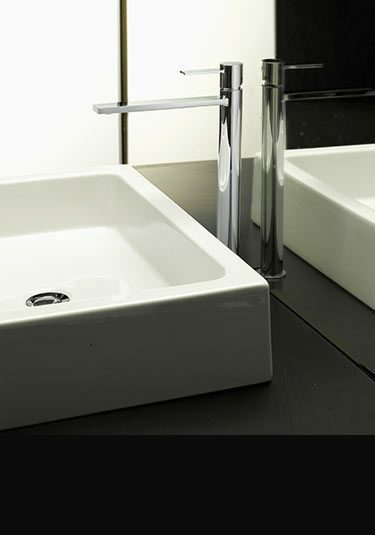 This contemporary basin filler is Italian designed, and an ideal design choice for luxury bathrooms. 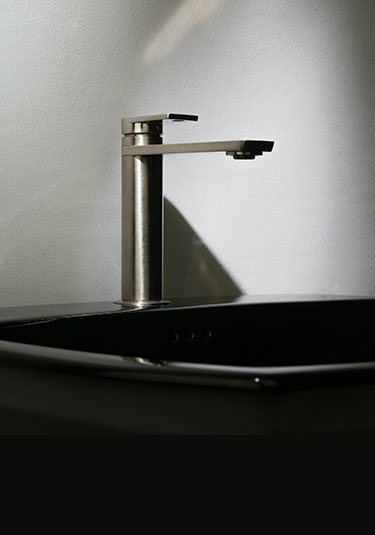 A nicely compact but still very stylish waterfall basin tap in the latest Italian styling. This luxury nickel bathroom tap makes a lovely design theme within a design led bathroom. The water calmly cascades from the 100mm waterfall spout. 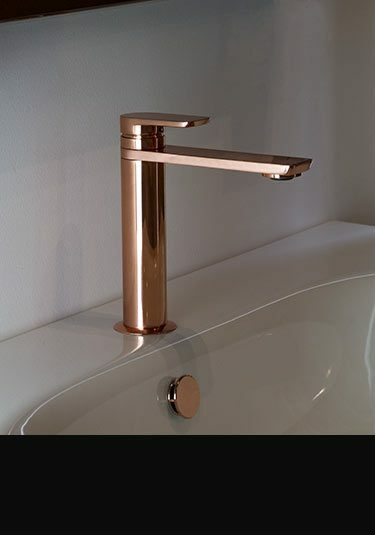 The latest in Italian styling and high quality European manufactured, this basin tap makes a lovely design statement within luxury bathroom style. 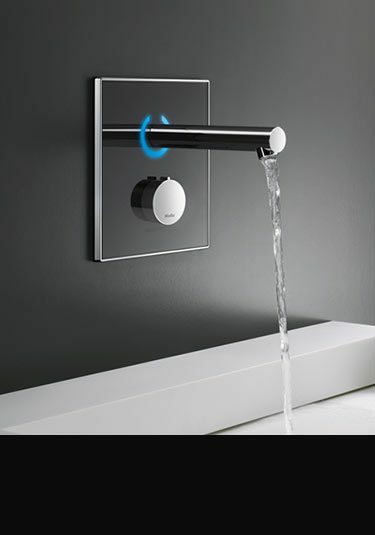 Available with a left or right handed waterfall spout & remotely controlled by single of double taps. 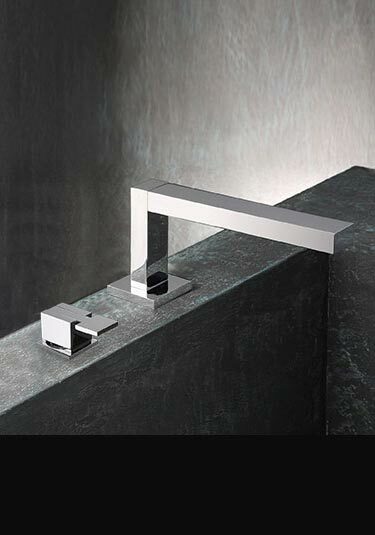 A beautiful quality basin tap in the latest Italian waterfall styling. 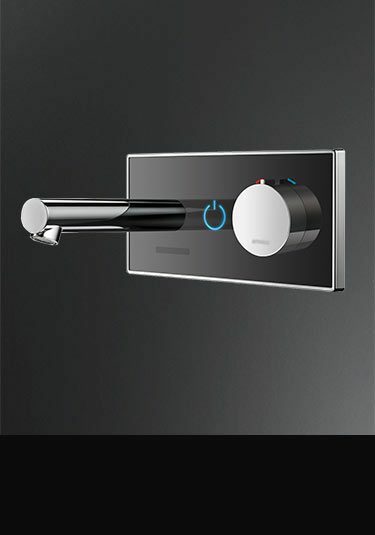 This luxury waterfall spout is operated remotely using either a single of double tap control. 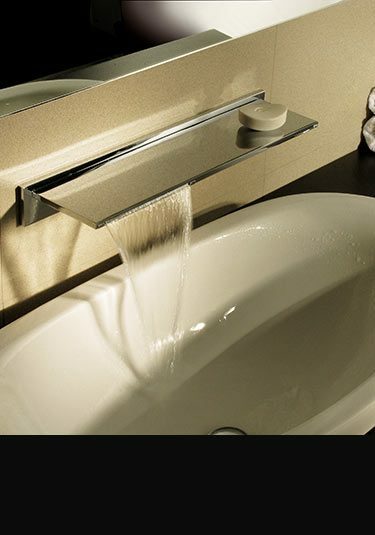 Designed and manufactured in Italy this wash basin tap has an open waterfall spout for the water to cascade from. 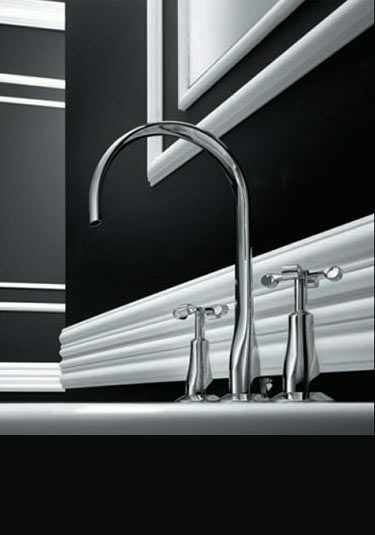 This lovely genteel tap produces an exclusive design theme in high end bathrooms. 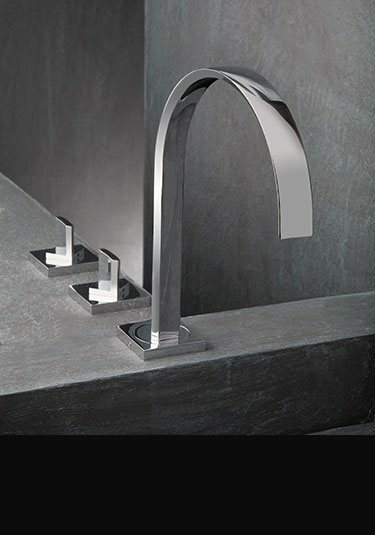 This tall waterfall tap has a large open spout for the water to cascade from in a tranquil fashion. Extended in height, this waterfall basin filler is designed for counter top wash basins and wash bowls. 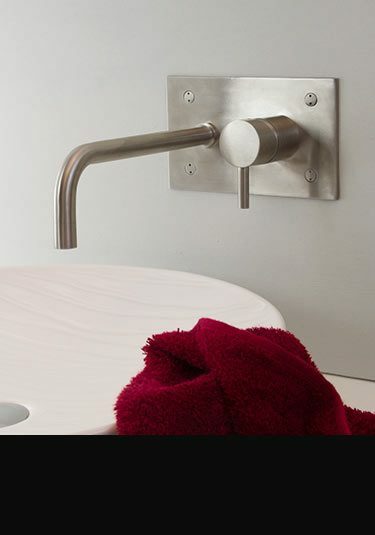 This single lever washbasin tap is designed to be recessed into the wall for flush mounting. 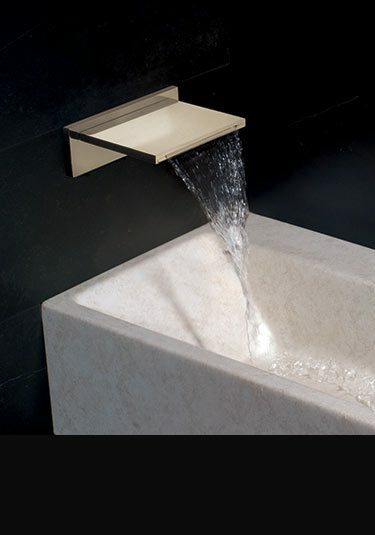 Each basin wall tap has a large open waterfall spout for the water to cascade tranquilly from. 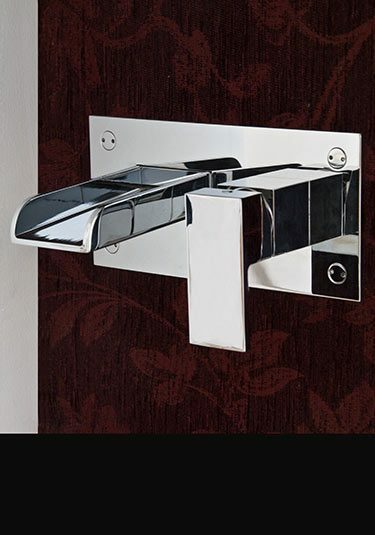 A stylish choice in designer bathooms this tap is made of solid brass with a thick chrome finish.